Ah, the frustration of being bested by a conservative woman. Too funny. It must be really tough being as limited as you are Todd. It is a true testament to mediocrity that you were ever elected dog catcher. Steve Frisch, I am very well liked and respected here. Enough so that I beat two eco’s nuts in a district they should have owned. But, hey, I was elected in a free willed election by people with free wills. At least I did not rob my employees of their hard earned tax dollars. First, your comment that I wish to hurt people is misplaced and basically below the limited dignity demonstrated in this conversation. I don’t wish to harm anyone. Second, you have failed to respond to the key point, the logical fallacy that Russ perpetrated with the original photo and comment, that there is a direct relationship between the low number of school shootings and armed teachers in the classroom in Israel. I will simply leave the conversation there since there really is no point in discussing a moving target. Thanks for the correction Dena–so I take it your position is that the government should have the right to compel involuntary commitment based on the opinion of a doctor and a perceived future threat? You tell me. My great aunt lives in fear of spying and physical harm as the results of her illness. She will not take the medication that would help her and while she is no danger, others are and we do know in in many cases. The best solution would be better medications with fewer side effects and longer action. There may also be other forms of treatment that need more development. You would subject people to live in fear when help exist. Now I ask you who is the one in this conversation who wants to hurt people? Although the case of your great Aunt looks interesting it has nothing to do with the core issue. The topic of the original post was school shootings, not involuntary commitment. So is it your contention that Alberta was involuntarily committed because she refused to teach phonics rather than suffered from paranoid schizophrenia, or that teaching phonics leads to school shootings? Her termination from work may have resulted in the schizophrenia coming to the surface. She might have lived a happy life helping children but instead had a great deal of pressure on her having lost one of the best job available to a woman at the time. The end result was a landmark case that change how we treat people who refuse treatment. Not being able to commit people who need help has resulted in a much larger homeless population and many people are unable to get help for their adult children because they now have the ability to refuse treatment even when it’s badly needed. Almost all of the shootings have shown mental problems long before the shooting and the common thread is they haven’t received the help they need because of the law or because medical people being aware of the limits placed on them by the law. Today Alberta is no better than she was back then but the lucky thing is that she is not a danger to others. She is aware that many people do need help and her case may have harmed others but she thinks she is not ill and the drugs she will not take are evil. P.S. SHE REFUSED TO TEACH SIGH READING. She argued sight reading wouldn’t work and insisted the time tested phonics was the only way to teach these children how to read. I always love it when people try to use that Franklin quote to demonstrate that individual liberty to own and possess ever more powerful weapons is an “essential” right to secure liberty. Of course it would be nice if the people who used it knew and appreciated its original context. First the quote was not referring in any way shape or form to either the second amendment or even to the the United States and its Constitution. The quote predates the formation of the United States and its Constitution by more than 30 years. The quote was included in Benjamin Franklin’s letter dated November 11 1755 in Reply to the Governor of Pennsylvania on the use of the public treasury to purchase and distribute arms and ammunition to counter the indian attacks on western Pennsylvania settlements and published in the Votes and Proceedings of the House of Representatives, 1755-1756. The letter refers to the question of whether or not the colonists should be taxed for common defense and those taxes used to arm settlers on the western frontier. So lets explore the context of the quote. Franklin was imploring the state Governor, a Royal appointee, to tax the people, to arm the people as a militia to act in addition to their own defensive capabilities, to protect themselves from a specific threat, the rising of the Delawares and Shawanese against settlers, but to also allow to them to defend themselves freely against attackers, rather than solely accepting the defense that came from the King — which wasn’t working. Franklin wasn’t saying that the threat of attack wasn’t real, or was exaggerated; he not only conceded it but it was what was driving his whole discussion. In other words he was referring to a specific threat that the government as a representative of the people first had a responsibility to defend and if it failed needed to grant the people the liberty to defend. That is a pretty different context than the one that modern ideologues frame Franklin’s statements in, that a general right to keep and bear arms is securing liberty. The use of the quote today to make the case for a general right to keep and bear arms without restriction is completely disingenuous. It is both historically inaccurate because it does not refer to the question at hand that the quote was addressing and it does Mr. Franklin a disservice because it attributes to him a supremacy of the individual over the legitimate power of the government that Franklin not only supported but fought for as a diplomat and risked his sacred honor to defend. That should read a “false supremacy of the individual over the legitimate power of the government”….. It was the Federalist who wrote the constitution and the Antifederalist who wrote the bill of rights. The bill of rights came into being because as a condition of accepting the constitution the states wanted assurance that the states would retain power over the federal government. The second amendment was one of the way the state could recover lost power should the federal government get out of bounds. If the federal government restricted firearms the state would not be able to overpower the federal government to regain it’s freedom. This fear was so great that the Antifederalist where against standing armies in times of peace. So far the military has been aware of this responsibility and I think would have stood against the president in the case of a power grab. There have been a few exceptions in the past with McCarthur being one of them. Today there is a question because Obama has been replacing many of the top commanders in the military with people less likely to resist his orders. Could this turn out to be something to fear? At this point I don’t know because we really don’t know how far Obama would go. So far he has gone past the limits of any other president and shows no indication he will stop. You tell me which line he will not cross as I have no idea. And should he cross that line, how will we recover our freedom? With knifes, swords, bow and arrows? That didn’t work out to well for the indians. The point I was making is the countries you called out are gun free or guns are highly controlled. Obama gone way beyond his constitutional limits and the left applauds him doing so. The republicans can impeach but the senate would never convict. We are very near having the public lose control of the government and should that happen, our options will be to live as slaves to the government or overthrow the government. The founding fathers expected us to reach this point a long time ago and it show how well the people followed the plan of the founding fathers that we have lasted this long without another revolution. The price of freedom is living in a society that appears more violent than others, Do consider all three countries have spilled a great amount of blood belonging to those who opposed the current government of those countries. The blood spilled would far exceed what we have spilled by keeping the right to bear arms. Funny, I would not put Italy, Spain, Austria, Turkey, Chile, Poland, Uruguay, Luxembourg, Ireland or Portugal in that category of ‘gun free’, nor would I put them in the category of countries that appear to be more violent than others as a ‘trade off’ for securing freedom. I think that if you believe trade off death for freedom is what the Founders had in mind as a permeant condition in the Republic you are sorely mistaken. Peace was the blessing of freedom they were seeking not the value they were willing to give up. You are very blind to the freedoms we have already given up to the government with nothing in return. With around 100,000 pages of laws at the federal level and even more at the state and local level I suspect most people have violated one or more and nobody knows all of them. The now pay federal personal not to know the law but to know how to look up the one they need when they want to railroad somebody. Of the other countries you listed several have a fair amount of violence but it’s not often reported in our news. Spain had a terrorist attack not long ago that turned the county on its end and they voted in a socialist government as the result of it. Italy has had riots, Chile has the poor. We are far closer to the U.S. news and as the results we see our flaws more than we see the flaws of others. The topic of the original post was school shootings, not generic violence. I searched for school shootings in the countries I listed and found almost none. Little bit of moving the goalpost with every comment going on here. Let’s stick to the intent of the post, the idea that there are no school shootings in Israel because teachers are armed. My main point stands: the freedom our founders envisioned was not the freedom to trade off the death of innocents for the blessings of liberty. It’s about time someone pointed out the failure of your left progressive warm fuzz politics. Here is the story about my great aunt Alberta lessard – Lessard v Schmidt, the first case and what happens when left populates the courts as they did during the 60’s and 70’s. Now the rest of the story you can find by googling her name and the case name. This was the first case of it’s kind and is the reason why we have school shootings today. Of course I would not choose tyranny over freedom Dena, but the point that you would say that “we are nearing that point” in the US speaks volumes about the disconnect between solving the public policy issue and the mindset of people advocating for arming teachers. I picked the examples intentionally, to show that the correlation between gun toting school teachers and no school shootings is a non sequitur, or a conclusion that does not follow from its premises. The connection has more to do with culture than the presence of arms in schools. I could have picked Italy, Spain, Austria, Turkey, Chile, Poland, Uruguay, Luxembourg, Ireland or Portugal. Is that better? Funny, I just looked it up and there have been no school shootings in North Korea, Iraq, Iran, or Cuba either….. Interesting. All countries that have no way to overthrow an oppressive government. The reason why the second amendment was written in the first place. Would you trade your freedom for an end to mass shootings and yes it would come to that as we are nearing that point in the United States. Yep some more irrelevany facts from the Frisch. Re read what you posted and tell us what that has to do with anything. Amazing! Todd, my point was that Russ’s original post was a logical fallacy–a point I further elaborated on in my 1:03 pm post. 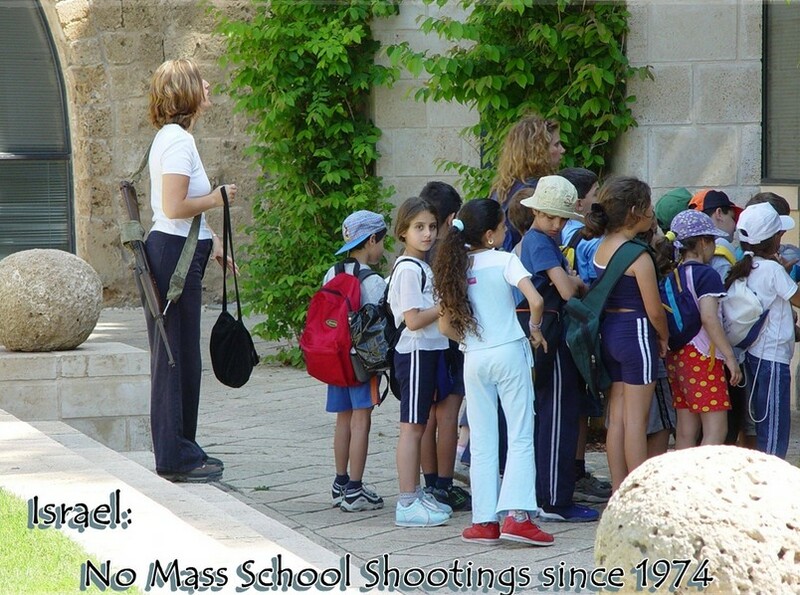 The point that some Israeli teachers are armed cannot be shown to have any bearing on the lack of school shootings.